Family holidays on tropical beaches make December one of the best times to visit Costa Rica. December starts out with lower prices and occupancy during the tail end of the rainy season. By Christmas the dry season is starting up, most hotels are sold out at for Christmas and New Years and the trails, zip-lines and white-water rivers are flowing with tourists. If you’re considering a “must see vacation” any time in the second half of December you should book before the end of October or you’ll find yourself scrambling. The second half of December is not a recommended time to try to wing it and travel without reservations. Early December weather is unpredictable. Often the rains taper off and the Pacific enjoys perfect beach weather most of the month. However, occasionally the rainy season continues full force right past Christmas (2017 was abnormally wet well into January along the central and southern Pacific). 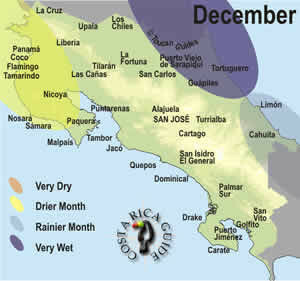 Costa Rica December rainfall pattern map. Late December is the beginning of the dry season, but clear weather is much more reliable on the Pacific side. On the other hand, in 2013 through the El Niño drought of 2015 it was like someone threw a switch in mid-November. The rain stopped in the Pacific northwest and tapered off fast across all of the west slope. For 2019 NOAA is predicting that neither El Niño or La Niña will occur which would imply that the dry season would start on schedule a few weeks before New Years however La Nada years are unpredictable. On the Caribbean side of the central mountains it’s wet at the beginning of the month and getting wetter by the end. Flooding is possible, especially in the northeast lowlands where polar air pushes across the Gulf of Mexico picking up heat and moisture then depositing it as continuous days of rain referred to locally as temporales del Atlantico. Another December weather phenomenon is strong winds called “Papagayos.” These winds are most common in the northwest and are caused by cooler, dry air moving down from the north and displacing the moist, warm dense, tropical air mass. The air moves across Costa Rica as a result of the pressure difference and accelerates through gaps in the central mountain ranges and can exceed 100 kph. The beaches and lowlands experience high temperatures in the seventies to mid-eighties and low temperatures in the sixties to mid seventies. A day or two of temperatures in the mid nineties is possible at low elevations and especially on the Nicoya coast during December. Around San José and the Central Valley temperatures are 5-10 degrees cooler and temperatures at high elevations over 5,000ft can be 20 or even 30 degrees lower in December. December competes with whichever month Easter falls in (April in 2019) as the most popular for Costa Rica travel. About 90% of lodge and hotel rooms are booked by the end of September for the week before and after Christmas. It’s the heart of the high season for sun seeking international travelers plus Tico schoolchildren are on holiday. In 2017 the Caribbean Islands from Barbuda, and the Virgin Islands to Puerto Rico were devastated by hurricane Maria, Irma and 15 other named storms in the most active season in nearly 100 years leaving palm trees were snapped off at the base and many buildings leveled by winds. In contrast Costa Rica was relatively undamaged. Although the flooding that accompanied tropical storm Nate (October 2017) was tragic and destructive in Costa Rica there was relatively little damage to tourist infrastructure. Within a few weeks the beaches were back to normal. Large numbers of travelers decided to forgo their traditional island destinations and try Costa Rica instead setting records for occupancy in December of 2017. December of 2018 will be at least as crowded. Reservations (as far ahead as six months to a year for some of the more popular hotels) are strongly advised. If you’re going to try traveling without reservations consider that the inland and mountain destinations are not quite as popular as the beaches so you might have a bit more flexibility there. Hotels and lodges have higher peak season pricing (20% to 50% more than high season) around Christmas and New Years Eve and many resorts and lodges have mandatory dinners and parties on those two nights (usually $50 to $100 per person). Minimum stays of three to seven nights are also common during the holidays so plan accordingly. For the second half of December we strongly recommend booking your lodging and airfare at least three months in advance and six to twelve months ahead is better for availability. If you like the sound of Dry Season, but would prefer more predictable weather and to avoid the Christmas crowds try traveling in February or early March before the Spring Break and Easter crowds arrive. A mild El Niño (warming of the Pacific Ocean) is predicted to taper off in mid 2019 leaving December in a La Nada pattern with particularly unpredictable weather. approximate exchange rate ¢618 per $U.S. Festival de la Luz – San José’s week long festival of lights is marked by lighting displays and concerts and fireworks after dark in the park. Fiesta de la Yeguita – Bullfights and a parade followed by a party in the parque central of Nicoya with food, concerts and fireworks. Tope Caballos – A horse parade through downtown San José proudly displays the equine traditions and unique Criollo breed.